It was hard to keep up with Ubisoft's Chris Early in San Francisco last night. Speaking as Ubisoft's Vice President of Digital Publishing, Early outlined a wide range of initiatives to bring together all the different franchises and platforms we enjoy. He likened all the Ubisoft brands to members of one family, but the metaphor that resonated most with me was his comparison of videogames to spectator sports. Being passionate about sports, Early suggests, is so much more than just going to live games or matches. It also generally encourages fan behavior outside of the sporting event itself - from branded hats and jerseys to call-in radio shows and pick-up games in the park. Ubisoft wants to build that sense of relevance and connection through a concept Early calls "Companion Gaming." The company took its first steps in this direction last year with the launch of U Play, which provides a single structure for rewards that can be earned and shared across the games in Ubisoft's catalog and across the various platforms on which those games are published.This year, U Play will also benefit from helpful walkthroughs and videos that the player can access from within the games themselves. No longer, Early jokes, will you have to balance a laptop on your knee as you search for secrets in the latest Ubisoft games. While I doubt the folks at GameFAQs are particularly worried about the impact of U Play, ready access to hints and tips should help the more mainstream gamers it seems most publishers are courting lately. But there are changes more significant than the planned additions to U Play. Early revealed a new model for taking your success in one game and translating that into specific rewards in games from that same franchise on other devices. The three test cases for this new interoperability are the upcoming Assassin's Creed Brotherhood, CSI: Fatal Conspiracy and Petz, all of which will benefit from stand-alone Facebook games where rewards and challenges are shared with the core console versions. Launching today, Assassin's Creed: Project Legacy is a Clan Wars-inspired social RPG playable on Facebook. 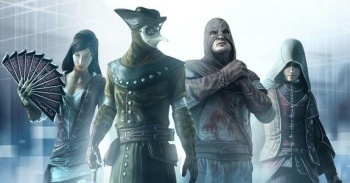 Players will have a unique assassin profile, complete with skills and abilities. Will you be an assassin who specializes in open conflict or political intrigue? Will you stick to the shadows or trust in your knowledge to protect you? Each assassin unlocks a linear set of Mafia Wars-style missions that have unique, sometimes random rewards and require specific prerequisites. You might go on an extortion mission that requires you buy a fancy gift, but that mission might garner you a courtesan you can use for a later mission. Later, more dramatic missions might require you to have a number of soldiers or warhorses in your retinue. As you gather items and landmarks on Facebook, you'll unlock those items in the console versions of the games. And as you complete missions in the console version, you'll open up new missions on Facebook. It's all part of what Early calls "the virtuous cycle."